Helical Solutions and Harvey Tool have teamed up to provide a free ebook on High Efficiency Milling techniques. 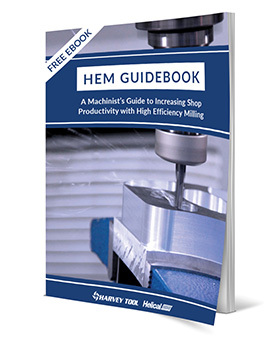 The HEM Guidebook is jam-packed with over 50 pages of milling strategies, best practices, and pro tips relevant to any machinist aiming to boost their shop’s efficiency. High Efficiency Milling, also referred to as dynamic milling or high efficiency machining, is proven to improve productivity, decrease cycle times, and increase tool life. Download your copy today and let High Efficiency Milling lead the way to a more profitable, productive shop. Decode the ins and outs of high efficiency milling, high speed machining, and how to take advantage of HEM techniques with miniature tooling. Learn how to increase your shop’s efficiency with strategies that shorten cycle times, enhance part finish, and avoid premature tool wear. Access exclusive HEM tips, milling insights, and case studies from professional machinists.